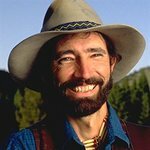 Jim Stoltz – better known as Walkin’ Jim – was a folk singer-songwriter, photographer, poet, storyteller, author and conservationist hiked more than 28,000 miles of rugged North American wilderness, crossing raging rivers, mountain ranges, vast deserts, dense forests and canyon lands from the Appalachians to the Olympics and from Mexico to Canada. When he wasn’t exploring, he was using his rich baritone voice to share original heartfelt songs, poems and stories “from the wild places” to children of all ages. His love and concern for animals and the habitats where they thrived inspired founding of the organization Musicians United to Sustain the Environment. Jim Stoltz has passed away, but we remember his charity work. Google trends for "Jim Stoltz"
We don't have any videos related to Jim Stoltz.